Materials scientists from the UCLA Samueli School of Engineering have developed a highly efficient thin-film solar cell that generates more energy from sunlight than typical solar panels, thanks to its double-layer design. The device is made by spraying a thin layer of perovskite onto a solar cell made of copper, indium, gallium and selenide, or CIGS. The team's new cell converts 22.4 percent of the incoming energy from the sun, a record in power conversion efficiency for a perovskite-CIGS tandem solar cell. The performance was confirmed in independent tests at the US Department of Energy's National Renewable Energy Laboratory. (The previous record, set in 2015 by a group at IBM's Thomas J. Watson Research Center, was 10.9 percent.) The UCLA device's efficiency rate is similar to that of the poly-silicon solar cells that currently dominate the photovoltaics market. The research was published in Science. "With our tandem solar cell design, we're drawing energy from two distinct parts of the solar spectrum over the same device area," said Yang Yang who led the research. "This increases the amount of energy generated from sunlight compared to the CIGS layer alone." Yang added that the technique of spraying on a layer of perovskite could be easily and inexpensively incorporated into existing solar-cell manufacturing processes. The cell's CIGS base layer, which is about 2 microns thick, absorbs sunlight and generates energy at a rate of 18.7 percent efficiency on its own, but adding the 1 micron-thick perovskite layer improves its efficiency - much like how adding a turbocharger to a car engine can improve its performance. The two layers are joined by a nanoscale interface that the UCLA researchers designed; the interface helps give the device higher voltage, which increases the amount of power it can export. And the entire assembly sits on a glass substrate that's about 2 mm thick. Control of the roughness of the CIGS surface and the use of a heavily doped organic hole transport layer were crucial to achieve a 22.4 percent power conversion efficiency. 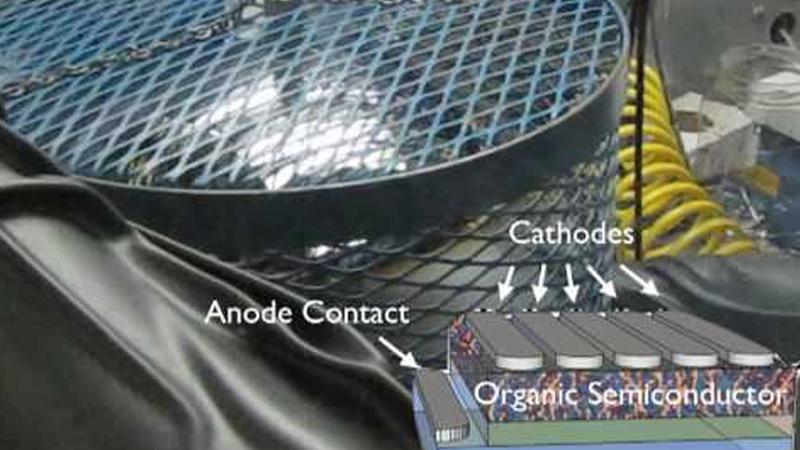 The unencapsulated tandem cells maintained almost 9 percent of their efficiency after 500 hours of operation under ambient conditions. "Our technology boosted the existing CIGS solar cell performance by nearly 20 percent from its original performance," Yang said. "That means a 20 percent reduction in energy costs." He added that devices using the two-layer design could eventually approach 30 percent power conversion efficiency. That will be the research group's next goal. The research was supported by the National Science Foundation and the Air Force Office of Scientific Research. Yang and his research group have been working on tandem solar cells for several years and their accomplishments include developing transparent tandem solar cells that could be used in windows.